The earpiece and one of the stereo speakers are located above the display, tucked behind a gray strip. The ambient light and proximity sensors, as well as the front-facing camera are also located in this area. The earpiece and the other stereo speaker can be found under the screen. Once again, they are hidden behind a gray strip of plastic. There is nothing on the left side of the smartphone. The power/lock key and the volume rocker sit on the right. The 3.5mm audio jack is on top of the handset, with a secondary microphone for active noise cancellation by its side. The microUSB port is on the bottom. The back of the Moto G (2014) is home to the 8MP main camera and its LED flash. The signature dimple with Motorola logo that debuted with last year's model range is there too. Removing the back cover reveals the micro-SIM card slot and the microSD card slot. The battery is sadly not removable. The new Moto G has the same 2,070mAh battery as its predecessor. Because of the larger display on board, we were a tad skeptical about the performance of the device in our battery test. It turns out that we weren't wrong. 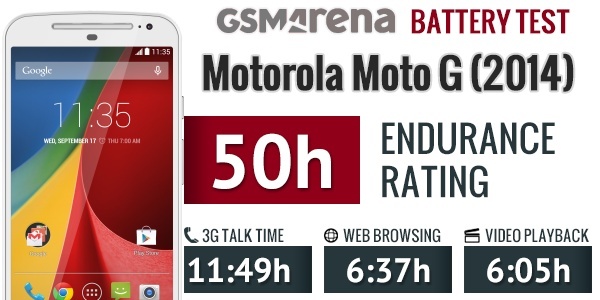 The new Moto G posted an endurance rating of 50h in our battery test. As expected, the score is slightly lower than that of last year's model. We should give the Motorola Moto G a few extra points here as its display is brighter than most of its competitors' at their respective 50% settings. This means that you will almost certainly squeeze out more from the device in real-life usage. Our routine also includes a standby battery draw test, which is not featured in our battery test scorecard but is calculated in the total endurance rating. Our battery testing procedure is described in detail in case you want to learn more about it. 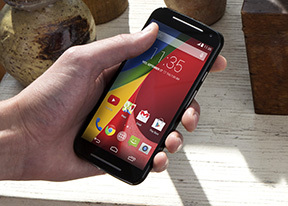 The new Moto G starts off with the basics - quad-band GSM/GPRS/EDGE and 3G globally. Also on board is Bluetooth 4.0 alongside Wi-Fi b/g/n with hotspot support. Wired connectivity is covered by a microUSB 2.0 port with USB host. Although it is missing some of the more advanced connectivity features like NFC, and IR-port, or LTE support (at least for the time being), the 2014 Moto G does have an FM radio and GPS with GLONASS.